Whether you're a professional blogger or just blog casually as a hobby, a facility to access and manage your blog while on the go is an added advantage. Android users can use some of the best applications they can use to easily maintain their blogs through their smartphones. Once installed, these applications allow you to post, edit and delete your regular blog posts through a user-friendly interface. All these blogging apps work seamlessly on all the popular variants of Android flavors. Make sure you thoroughly test these apps on a dummy blog before using them for a live blog so that you can get familiar with the functions and features. This will also ensure that your content is not deleted inadvertently while learning the application usage. These apps are available for all the popular blogging platforms whether it is WordPress or Blogger. While using these blogging apps, one must understand that these solutions are not full-fledged blogging solutions for the respective platform. Let's test these Android blogging apps. Blogger - This is the official Blogger app made by Google for their blogger platform. It has a large user base and the application itself is updated on a regular basis. Apart from composing new posts and saving drafts, one can also edit old posts through a user-friendly editor. You can also switch to a different blogger account if required. Much needed image embedding feature is also present in the app which allows you to pick image either from the gallery or directly from the phone camera. One can also add multiple labels and the location information while composing or viewing blog posts in the editor. WordPress - This powerful WordPress application for Android supports both hosted and self hosted platforms of the famous blogging engine. It has almost all the required features an average blogger may need to run and manage his blog. I like the interface of this app which is defined by the developers to make it as user-friendly as it can be possible. This app also has a powerful stats section which is useful in analyzing the vital statistics of the blog. Media embedding through this app is quite easy and one can easily create rich media posts without any hassle. It has 2-factor authentication for added security. Tumblr - If you're running a Tumblr blog, this is the best Android app to manage it on your smartphone. Apart from regular text, one can also post rich media through this app quite easily. It also places a post creation widget on the home screen for quick access. This app also lets you exchange messages with the readers. Users having multiple Tumblr blogs can manage all of them through this application. You can also save new posts in the form of drafts for deferred editing. Similarly, custom tweets can also be crafted through it. The application itself is blazing fast and works seamlessly. Squarespace - Squarespace bloggers can use this app both on tablets and smartphones powered by Android. Apart from writing and editing posts, one can also manage blog comments. It fully supports markdown making the writing process, a breeze. The interface is soothing to the eyes and all the controls and prompts are obvious and user-friendly. Avid bloggers running multiple blogs can quickly switch to different blogs with a click to manage all of them right within the application. I liked its photo managing feature which allows you to easily align them in the best possible way for a nicely formatted post. 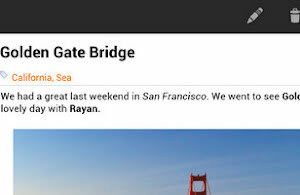 Blogaway - This is a powerful and popular Android blogging client made for Google's blogger platform. Apart from inserting photos, it also allows you to easily embed videos within your blog posts. It has rich formatting options and the posts' drafts are automatically saved in the device's local storage to avoid content loss in case of disconnection. It also has a full-fledged comment management and moderation module to interact with the visitors from within the app. Bloggers can also add signatures at the end of each blog post if required. It also has a handy bookmarking option to read your favorite posts at your convenience. Bloggeroid - This is yet another feature-packed Android app for blogger platform. The good thing about this app is that it is completely ad-free. It has all the regular features for adding and editing blog posts. Similarly, one can easily moderate blog comments through it. It also allows easy content sharing on Google+ from within the application. Like other popular blogging apps, this one also supports management of multiple blogs. It can work with app-specific passwords in case you've activated 2-step authentication for your Google account. You can also save and extract blog posts from your SD card.